KUALA LUMPUR: Malaysia is poised to improve its standing as one of the world's top global destinations due to its many tourist attractions. The country is already the ninth most-visited country in the world and its tourism industry remains a major contributor to gross national income (GNI), foreign exchange earnings and employment. 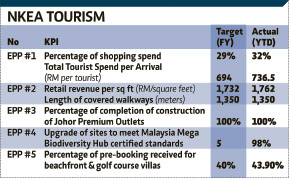 Tourism industry is the seventh largest contributor to the country's economy with a GNI total of RM37.4 billion last year. It is expected to contribute RM66.7 million to the national GNI by 2020, according to the Economic Transformation Programme (ETP) annual report. The Tourism National Key Economic Area (NKEA) has identified 12 Entry Point Projects (EPPs) across five themes to achieve its GNI target. The first theme is affordable luxury shopping such as duty free for wider range of goods, making Bukit Bintang-Kuala Lumpur City Centre as premier shopping district and opening three new premium outlets. The second theme is family fun which includes the development of an eco-nature resort city in Sabah and developing cruise-related tourism products. Events, entertainment, spa and sports are the third theme whereby the ministry will target more international events, establish dedicated entertainment zones, develop local expertise and better regulate the spa industry and promote the under-tapped golf tourism in the country. The fourth theme is business tourism where Malaysia will be established as a leading business tourism destination. The last theme is nature adventure which poses Malaysia as the pre-eminent global bio-diversity hub. Tourism NKEA will also focus on enhancing connectivity to priority medium-haul markets such as China, Japan, Australia and India.